Sometimes, visual voicemail messages become quite important for you, especially those from a friend or family member you love. So it’s necessary to transfer memorable voicemails from iPhone to PC or Mac before your carrier deletes them off the phone company’s server. 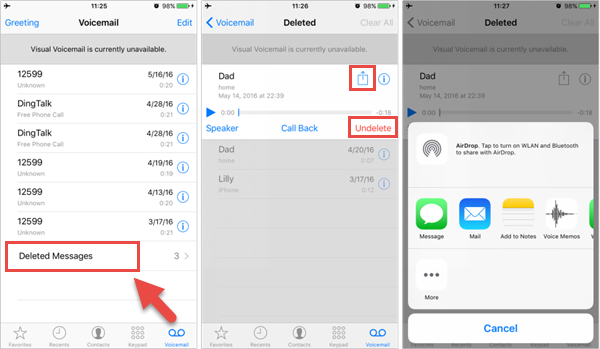 If you stored voicemails in unreadable backup file with iTunes, it will require a third-party utility to recover deleted voicemails on iPhone. Open Phone app and tap “Voicemail” at the bottom of the screen. Scroll down to the bottom of the page until you see the “Deleted Messages” folder then tap it. There you’ll find all the deleted voicemail messages. Select an item to highlight it. Tap on “Undelete” to restore. Or tap the share box (on iOS 9 or later) to send it to Message, Mail, Notes, Voice Memos, WhatsApp, etc. Tips: When moved to Voice Memos, Voicemails will be saved as voice memos in .m4a files. Then you can transfer Voice Memos from iPhone to computer for free. Check it out. We know your voicemails are important to you. That’s why the software Free iPhone Recovery is designed to recover, export, backup or save your voicemails from iPhone to PC or Mac computers. This utility makes it possible for you to retrieve your voicemails either directly from iPhone or even from iTunes backup with original .amr file format. Download & run iPhoneRecovery; Select Voicemail and go Next. Connect your iPhone to computer. Or skip to select an iTunes backup file to scan voicemails from it. 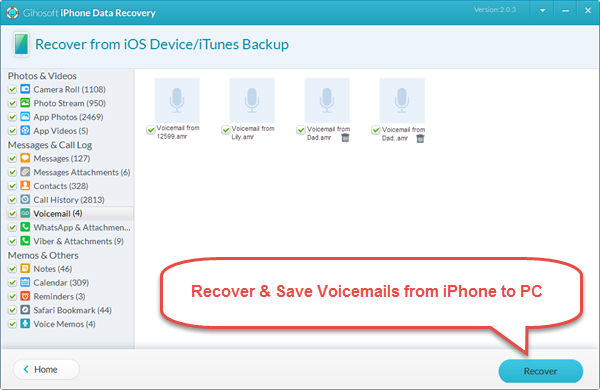 Select the voicemails, then save and export them onto computer by click the Recover button.